The beautiful wedding dress worn by Kate Middleton now the Duchess of Cambridge at the Royal Wedding on 29th April 2011 is to go on display at Buckingham Palace this summer from 23rd July to 3rd October 2011. 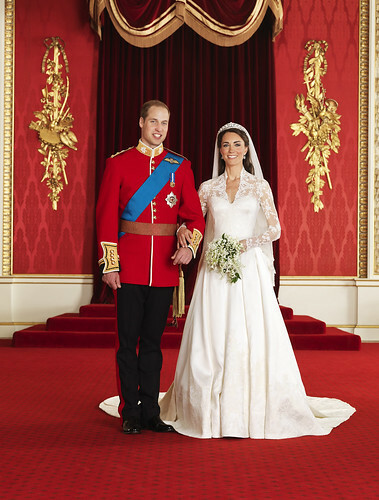 The Royal bride's veil, tiara, diamond earrings and shoes will also go on display along with the Royal Wedding cake. The wedding dress designed by Sarah Burton for Alexander McQueen is made from ivory and white satin-gazar and the train measures 2.7 metres. Kate worked closely with Sarah Burton on the design. The veil is made of layers of soft ivory silk tulle with a trim of hand-embroidered flowers and was held in place by the Cartier 'Halo' tiara which was lent to Kate by the Queen. The tiara had been given to Queen Elizabeth by her mother on her eighteenth birthday when she was still a princess. The shoes were also hand-made by the design team at Alexander McQueen. The diamond earrings were a gift from Kate's parents and were commissioned especially for the occasion from jewellers Robinson Pelham. The design incorporates aspects of the Middleton's family's new coat of arms such as the acorn and oak leaves. The Royal Wedding cake which was created by Fiona Cairns will also be on display in the State Dining Room.